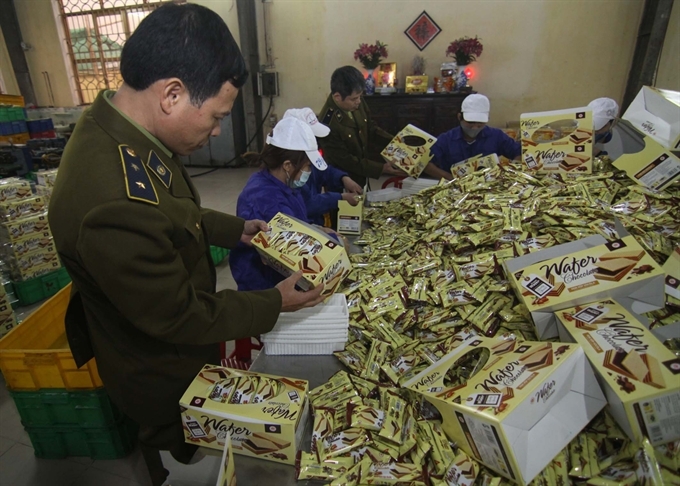 HÀ NỘI — The infringement of intellectual property (IP), manufacturing and trading of counterfeit goods in Việt Nam has become increasingly complicated with more sophisticated tricks being employed. Yet, most violations were punished with administrative penalties. Statistics from the Ministry of Science and Technology (MoST) showed that relevant forces have inspected and detected 25,966 cases of intellectual property infringement, fake production and sale, between 2012 and 2015. Of these, 25,543 cases have been levied administrative fines and 381 cases were prosecuted, with 553 arrestees. Lê Xuân Lộc, a laywer from T&G Law Firm, said administrative punishments on IP violations were popular as the procedure for settling in these cases occurs quickly and saves costs compared with other remedies, like civil or criminal ones. However, he said, due to a lack of severe punishments, the administrative punishments didn’t achieve desired results. Lộc said one particular identification case surrounding unhealthy competition relating to amway2u.vn domain. After the company owning the Amway trademark filed a request at the inspectorate of the MoST, the competent agency forced the violator to pay an administrative fine and return the domain. However, the violator refused to comply with the request. According to Vũ Xuân Bính from the Market Surveillance Department, under the Ministry of Industry and Trade, the department found 1,342 cases of IPR violations and fake products in the first six month of 2016, which accounted for total fines of VNĐ769 billion (US$345,000). Confiscated goods were worth a total of VNĐ11.5 billion ($515,000). Counterfeit goods, infringing IP, are not only produced in the country but are manufactured in foreign countries and then brought back for domestic consumption, which caused serious impacts on consumers and the whole community. Fake goods which range in price include medicines, supplementary foods, building materials, and electrical appliances. Bính pointed out inadequate punishments and manpower, and lack of co-ordination among enforcement agencies as major challenges in dealing with violations of intellectual property rights (IPR). He said these issued must be tackled by strengthening the effectiveness of IPR enforcement which will result in more cases settled by criminal or civil remedies. Relevant agencies should closely co-ordinate with each other to improve the legal framework, he said. Phạm Văn Toàn, deputy Chief Inspector of the Ministry of Science and Technology, said Việt Nam was one of a handful of countries in the world that imposed administrative punishments on IPR violations. Nguyễn Hữu Cừ from the Economic Crime Investigation Police Agency said the agency found 286 cases of IPR violations (fake production and sale) in the first six month of this year, of which 49 cases have been prosecuted. Cừ attributed the low rate of prosecuted cases to the poor awareness of people on IPR regulations. They didn’t recognise the importance of product registration except for some foreign-related enterprises, thus, resulting in abuse of reputation by violators. He also blamed legal obstacles such as vague definitions used on the law relating to IPR for low enforcement through criminal remedies. However, he said, it was settled in the Criminal Code 2015. According to Nishiyama Tomohiro, chief advisor from Japan International Co-operation Agency (JICA), the JICA funded a project entitled Strengthen Effectiveness of Intellectual Property Rights Enforcement aiming to improve the capacity of manpower and co-ordination of agencies in handling IPR cases as well as raising awareness of the people about the harmful effect of IPR infringement. Then it would help eradicate fake goods in the market. For example, if contraband goods were medicine, it would affect people’s health. However, it takes a long time for consumers to understand and be aware of this issue, he said.